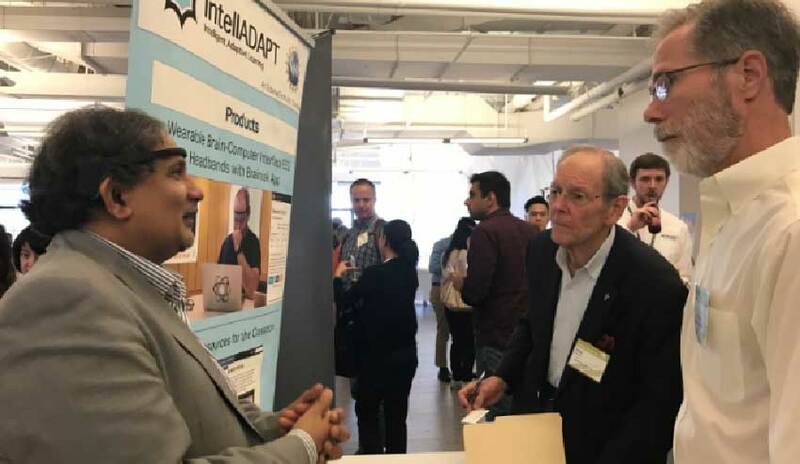 On Wednesday, June 14, 2016, intellADAPT, a Boston based educational technology and Adaptive Learning Startup, was invited by the MIT Enterprise Forum to show case the first Brain Computer Interface (BCI) for STEM education at MIT Start-up Spotlight 2017 at Hatch Fenway in Cambridge, MA. IntellADAPT demonstrated its Brainwave Adaptive Learning technology at the showcase with live demonstrations. The demonstration consisted of the use of an EEG headband to record brain activity while student is preparing for high stake examinations. Attendees were impressed by intellADAPT’s ability to determine the best way a person can learn within an hour. intellADAPT is excited about this ground-breaking technology and will be gearing up for its commercial implementation in the coming months. IntellADAPT has developed brain-training equipment that allows students to prepare for a high stakes examination by identifying the best learning strategy and controlling exam anxiety by receiving real time neuro-feedback in practice examinations. Stay tuned for the product launch event soon.